If you prefer a close-in urban commune with nature, our Buffalo Bayou Kayak Tour in the heart of Houston is just the ticket! Our put-in is the boat launch at I-610 and Woodway. 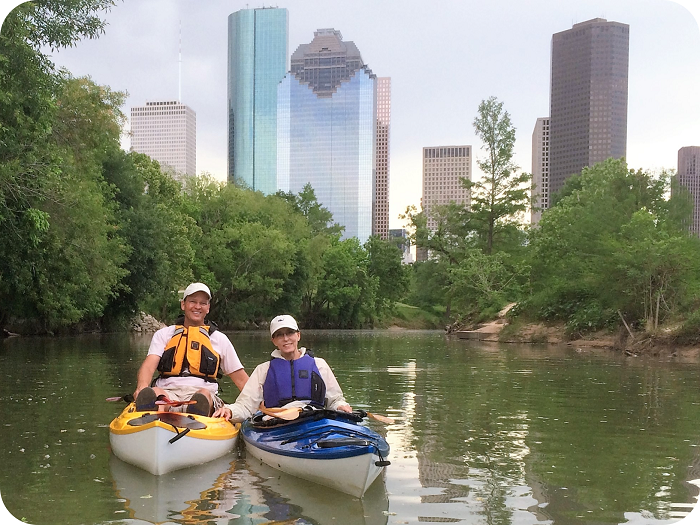 We'll paddle through Memorial Park and the recently opened 160 acre Buffalo Bayou Park. We'll take a break at the Lost Lake Visitor Center before continuing our leisurely float downstream past the Waugh Bridge Bat Colony, Johnny Steele Dog Park, Houston Police Officer's Memorial and numerous iconic fountains and artwork. We'll end our trip with spectacular views of downtown Houston and a take-out near the Sabine Bridge Promenade. Want to continue your adventure on your own? Explore the park trails by bicycle or foot with bike rentals available near the take-out. Select your tour date and kayak from the pull down menus. Need help selecting a kayak or prefer a custom tour date? Call or email us! Trail Expeditions is a member and follows the guidelines established by the American Canoe Association for Outfitters, Liveries and Guides.